I am delighted to present this exciting guest post about St Willibrord the patron saint of Luxembourg who has an interesting connection to Co. Carlow. The post is written by Dermot Mulligan curator of the Carlow County Museum. St. Willibrord as featured in a stain glass window in the Basilica of Echternach, Luxembourg. Photo Carlow County Museum. Today November 7th is St. Willibrord’s Feast Day. He is from England, is the Patron Saint of Luxembourg, he was trained and ordained in County Carlow. 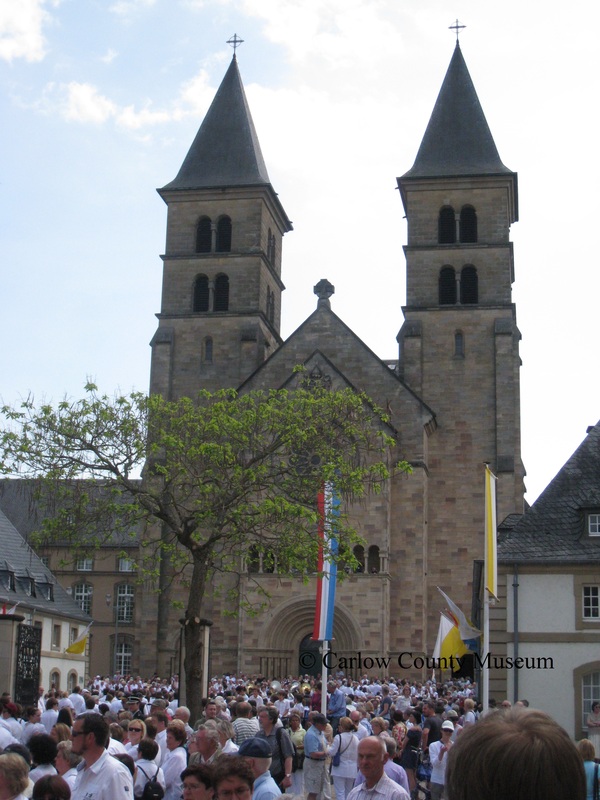 In 690AD he led a successful European mission from Carlow, and the annual hopping procession held in his honour in Echternach, Luxembourg has received UNESCO World Heritage Status. Located in the townland of Garryhundon, Co Carlow is an archaeological site commonly referred to as Killogan, Rath Melsigi (Rathmelsh) or Clonmelsh Graveyard (¹). The site of Clonmelsh Graveyard at Garryhundon is situated on private land and is not accessible to the public. A worthy alternative is the magnificent St. Laserian’s Cathedral, in the village of Old Leighlin. 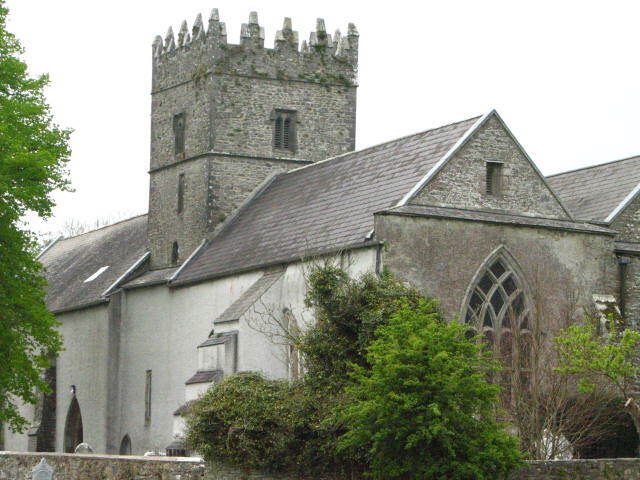 Image of St Laseran’s Cathedral Old Leighlin taken from Wiki Commons. During the seventh and eight centuries Rath Melsigi was the site of the most important Anglo-Saxon ecclesiastical settlement in Ireland (2). During the sixth century St. Colmcille established a monastery on the island of Iona off the coast of Scotland. In the late sixth century and early seventh century Carlow born (Myshall) St. Columbanus became the leading figure of Irish missionary work on mainland Europe. As a result of such work there were a number of monasteries established in Europe which had close relationships with abbeys in Ireland. It is believed that much of the early Anglo-Saxon manuscripts were written in Irish script either directly by Irish monks based in Britain or by Anglo-Saxon monks who were trained by Irish monks (3). Stain Glass window in the Basilica of Echternach depicting St. Willibrord at Rathmelsh. Photo Carlow County Museum. Building on this close relationship between Irish and European monasteries a number of ecclesiastical settlements were established in Ireland that accommodated European monks, in particular Anglo-Saxon monks. The most note worthy of these was the settlement in Garryhundon. It is quite likely that the site had a direct relationship with the monastery that was located at the site now occupied by St. Laserian’s Cathedral in Old Leighlin. This monastery, which is believed to have had over one thousand monks, was for several centuries a major ecclesiastical settlement. From 678AD to 690AD a student named Willibrord from Northumbria was trained and based at Rathmelsh (4). From here he led eleven other Carlow based monks on a major mission to the Frisian Land and in 695AD he was consecrated a Bishop by Pope Sergius 1 (5). St. Willibrord’s tomb in the crypt of the Basilica of Echternach, Luxembourg. Photo Carlow County Museum. He initially built a cathedral in Utrecht, Holland but later he moved to present day Luxembourg and to the town of Echternach where he founded an abbey. From here he continued to co-ordinate missions of the surrounding countries and in 739AD he died aged 81 (6). 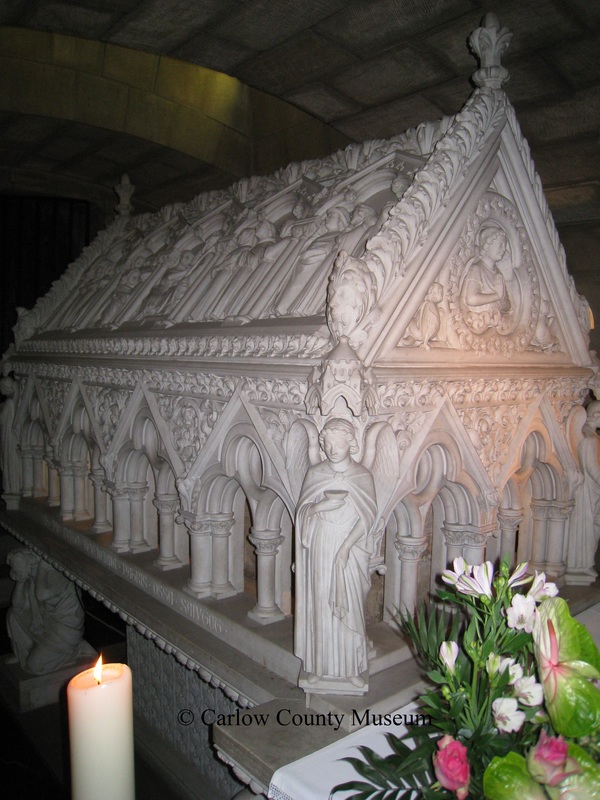 He is buried in Echternach, and he is the only saint to be buried in Luxembourg. As part of the abbey in Echternach he established a very important scriptorium and for a considerable period of time many great European bibles, psalms and prayer books were produced by the Abbey. It is likely that the initial scribes were from Carlow. Great devotion and religious festivals are still held to this day in his honour and in particular a hopping procession, a dance that dates back to, if not predates St. Willibrord’s life time. The hopping procession takes place annually on the Tuesday after Pentecost Sunday and over thirty thousand people descend on Echternach to partake along with dozens of Cardinals, Arch-Bishops and Bishops from over one hundred and sixty parishes across Luxembourg, Belgium, Holland and Germany who still have devotions to St. Willibrord. Hopping Procession in honour of St. Willibrord, over nine thousand people hop a two kilometer route from the monastery to the Basilica and past St. Willibrord’s tomb. Photo Carlow County Museum. The abbey is now home to a large secondary school and in the adjoining Basilica St. Willibrord is buried in the crypt under the altar. The hopping procession starts in the abbey square and proceeds for approximately two kilometers through the streets of the town, then into the Basilica, down into the crypt and past St. Willibrord’s remains. This unique procession coupled with the European importance of the abbey saw the procession granted UNESCO World Heritage Status in 2010 ( 7). 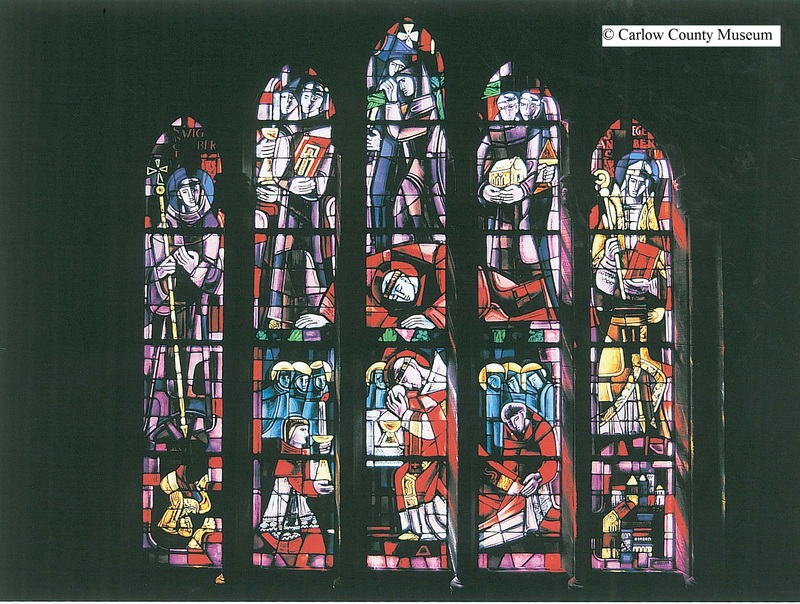 Towards the end of World War 11 the Basilica was badly damaged during the Battle of the Bulge but during the 1950s it was reconstructed including the instillation of a stain glass window depicting St Willibrord’s training, ordination and first mass at Rathmelsh(8). 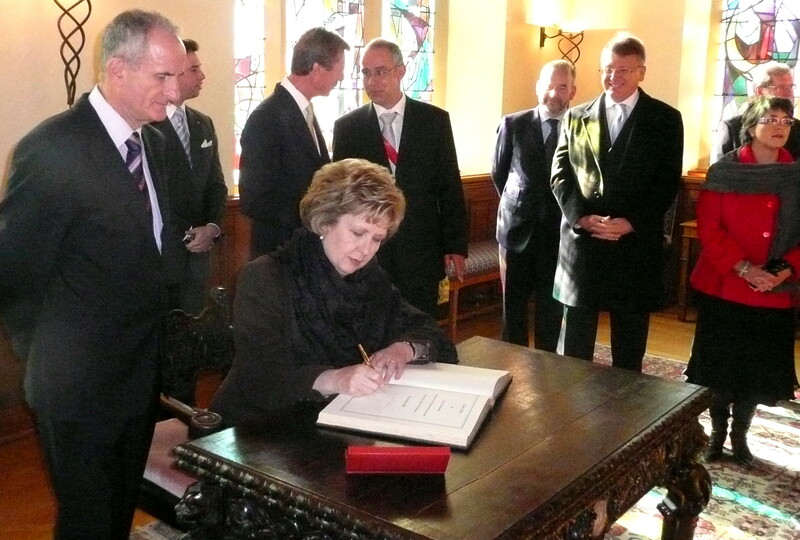 In October 2009 President Mary McAleese as part of her official state visit to Luxembourg visited Echternach. 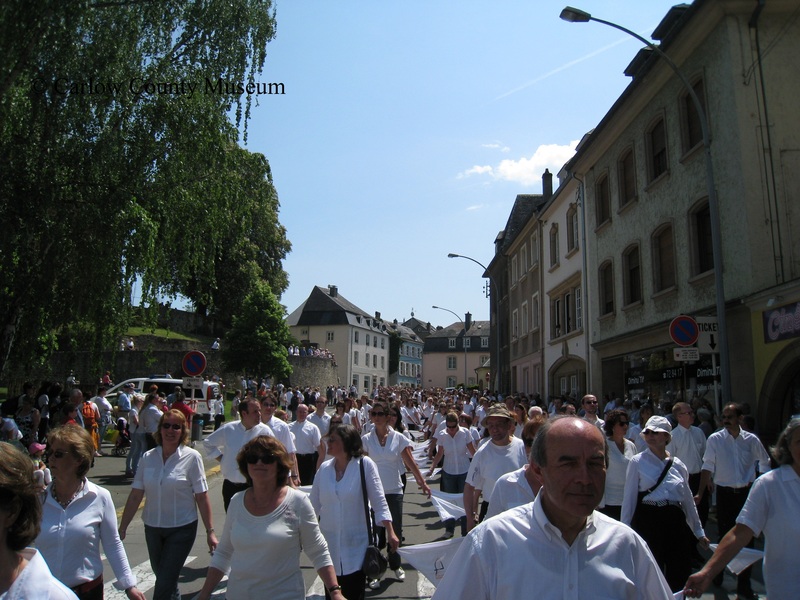 In May 2010 following an invitation from the St. Willibrord Foundation staff from Carlow County Museum visited the town during the famous hopping procession. In April 2012 Ireland’s newest County Museum, Carlow opened to the public in Carlow town and there is a section depicting St. Willibrord and his connection to the county. Post written by Dermot Mulligan Curator of Carlow County Museum. Information & pictures supplied by Carlow County Museum. 1 Recorded Monuments County Carlow 1995. SMR Number: CW012-025 Garryhundon. 3 Professor Dáibhí Ó Cróinin, NUI Galway. ‘The first century of Anglo-Irish relations AD 600 – 700’; The O’Donnell Lecture 2003, National University of Ireland. 4 Emile Seiler ‘St. Willibrord’; Carloviana, 2000. 5 Willibrordus-Bauverein ‘Die Basilika St. Willibrord in Echternach’.